The SpaceX Dragon resupply mission launch was earlier scheduled for Thursday at 5:55 PM EDT (2:55 PDT), but unfortunately it had to be postponed due to unfavourable weather conditions. SpaceX Dragon: What delayed launch of supply cargo to NASA ISS? Elon Musk's SpaceX Dragon cargo capsule to carry supplies to NASA’s International Space Station (ISS) couldn’t be launched as scheduled on Thursday due to bad weather and storms. SpaceX has now rescheduled the launch to June 3, Saturday at 5:07 PM EDT. The SpaceX Dragon capsule will be blasted off from LC-39A, the facility at Kennedy Space Center leased by the company from NASA. Also, SpaceX will attempt to recover the first stage of Falcon 9 at its LZ-1 at Cape Canaveral Air Force Base. After the launch on June 3, the SpaceX will attempt to connect with the ISS on June 4. It will remain attached to the space station for about a month and then will come back to Earth with a planned splashdown in the Pacific Ocean. The live feed for SpaceX will begin around 20 minutes prior to the launch, that is around 5:35 PM EDT or 2:35 PM PDT. Elon Musk's SpaceX Dragon capsule will visit NASA’s ISS for the second time and will carry supplies required by the crew. The SpaceX Dragon visited the ISS in 2014 for the very first time. According to SpaceX, the parts of Dragon have always been reused but this will be for the first time that they have been used to this extent. The SpaceX Dragon capsule will carry cargo weighing 6,000 pounds and will also include mice and flies for medical research. SpaceX’s 230-foot-tall Falcon 9 rocket will carry the Dragon capsule which is 20-foot high, 12-foot-diameter. This launch will be the eleventh commercial resupply services flight for SpaceX. The Dragon will carry important materials that will support over 250 science and research probes that would be conducted during Expeditions 52 and 53. The Dragon will be welcomed by US astronauts Peggy Whitson and Jack Fischer, who will grapple the capsule with the help of ISS’ 57-foot-long robotic arm. The robotic arm will then rotate and install the Dragon capsule to the Harmony module of the space station following ground commands form the mission control. The Dragon delivered around 2.5 tons of cargo to ISS back in 2014 and then touch down to Earth, splashing down into the ocean about a month later. Last year, Benjamin Reed, director of commercial crew mission management at SpaceX revealed the mission in a presentation at the International Symposium for Personal and Commercial Spaceflight. “We will be reflying our first Dragon capsule on CRS-11,” he said, using the company's designation for that cargo mission, known as SpX-11 by NASA. The Dragon was designed in such a way that it could be apt for reuse, however, the CRX contract of SpaceX with NASA required the use of a new Dragon spacecraft for each cargo mission. Reed said SpaceX has been working with NASA to demonstrate that the spacecraft can be safely reused for additional cargo flights, according to SpaceNews. “It's a great example of the partnership we have with NASA,” he said of that effort to win approval for the reuse of Dragon spacecraft. He said that the biggest challenge to reuse the Dragon was preventing saltwater from entering the capsule after it splashes down. “We've been working hard to update the capsule, to ensure that you don't have to worry about the seawater issue,” he said. 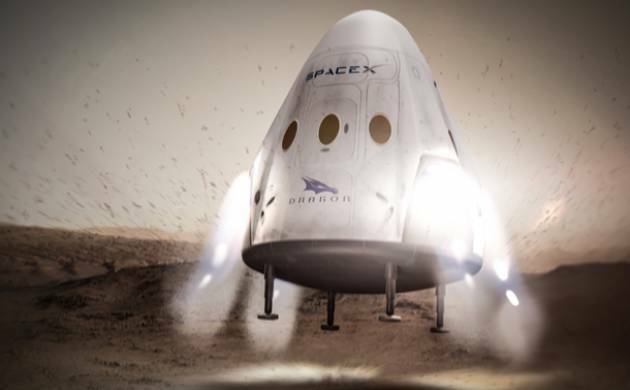 “We'll be reflying Dragons going forward, and be able to close down the Dragon 1 line and move all the way into Dragon 2,” he said, referring to the next-generation version of the Dragon being developed for commercial crew missions. SpaceX completed a record breaking launch earlier this month when it launched its Falcon 9 rocket to deliver Inmarsat-5 F4, a commercial communications satellite in its first launch for the company. The heavy payload of 13,448lbs went to a high orbit of 22,000 miles, hence the Falcon 9 rocket didn't have enough propellant left to land, SpaceX said before the flawless launch. “All systems and weather are go,” it said at 6:35pm. “From here I-5 F4 will be manoeuvred to its geostationary orbit, 35,786km (22,236 miles) above Earth, where it will deploy its solar arrays and reflectors and undergo intensive payload testing before beginning commercial service,” Inmarsat said. US space agency NASA has said that the SpaceX is all set to launch its Dragon spacecraft for the 11th commercial resupply mission to the International Space Station (ISS). The spacecraft is scheduled to be launched on June 1 from NASA’s Kennedy Space Centre. The SpaceX Dragon spacecraft, which will be launched atop the Falcon 9 rocket, will carry and deliver crew supplies, equipment and scientific research to astronauts who live aboard the ISS. Investigations that study neutron stars, osteoporosis, solar panels and tools for Earth-observation will be delivered to the ISS astronauts through the SpaceX Dragon spacecraft. "In addition to studying the matter within the neutron stars, the payload also includes a technology demonstration called the Station Explorer for X-ray Timing and Navigation Technology (SEXTANT), which will help researchers to develop a pulsar-based, space navigation system," NASA said. When massive stars explode as supernovas, they leave behind glowing cinders that are known as Neutron stars. Such stars contain exotic states of matter that are impossible to replicate in any ground lab. Because of the unique way they emit light, these stars are called ‘pulsars’. The light sweeps pas us when the star spins, and this phenomenon appears as if the star is pulsing. The physics of these stars is studied by the Neutron Star Interior Composition Explored (NICER) payload, affixed to the exterior of the space station. This provides new insight into their nature and behaviour. X-ray radiation is emitted by the Neutron stars, which enables NICER technology to observe and record information about its structure, dynamics and energetics. The new solar panels called Roll-Out Solar Array (ROSA) which are lighter and stores more compactly for launch than the rigid solar panels currently in use will also be sent to ISS. ROSA has solar cells on a flexible blanket and a framework that rolls out like a tape measure.